The government of Nigeria through Federal Mortage Bank of Nigeria (FMBN) has entered into an agreement with leading labor unions in the country for the implementation of a national affordable housing programme for workers. 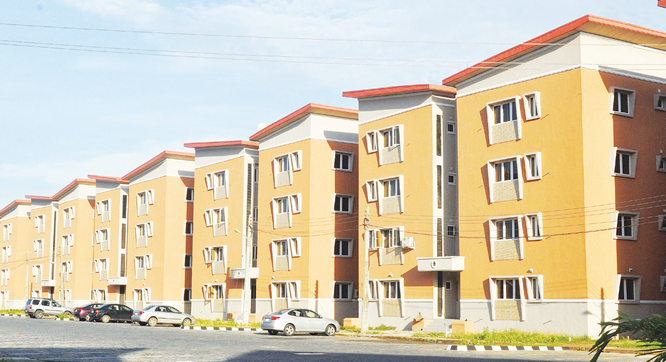 The project will kick off next month with the launch of 100-unit housing estate for Voice of Nigeria (VoN) in the Federal Capital Territory (FCT). FMBN will be kick-starting the scheme in two states and Abuja, in conjunction with the Nigeria Labour Congress (NLC), Trade Union Congress (TUC) and the Nigeria Employers’ Consultative Association (NECA). This will be followed by the development of Yola in Adamawa State and Umuahia in Abia State. The first phase of the scheme will deliver 2,800 housing units in 14 sites across the country. This includes 200 houses in each of the six zones including Lagos and Abuja. The current housing requirement for the workers is estimated at about 3,750,000 housing units. The houses are expected to provide safe, decent, quality and affordable housing to registered members of NLC, TUC and NECA that contribute to the National Housing Fund (NHF) managed by FMBN. FMBN’s Group Head, Corporate Communications, Mrs. Zubaida Umar, said the designs of the houses were based on tested local and international social housing models. “To ensure successful execution of the programme, the design and implementation plan was based on extensive deliberations and recommendation of housing experts,” she said. The house types will include semi-detached bungalows and blocks of one bedroom, two bedrooms, and three bedrooms. Speaking during the 2018 African Real Estate Conference and Awards organized by PropertyPro Nigeria, a member of ToLet Property Group in Lagos; Commissioner for Housing, Prince Gbolahan Lawal said the greatest challenge in housing is how to reduce deficit, stressing that government has set a target of 20,000 new housing units by the year 2020 as part of its multi-faceted approach to confront the three million shortfall. “Lagos State government is ready for private partners who are set to work with us. Our task is to ensure that enabling environment is possible. For affordable housing, our contribution as government is to make sure that you have land, provided you have the financial and technical ability to develop it. We will also ensure that you have land titles,” he added. I am a labour Man and Architect with the Ministry of Housing Asaba Delta State.